Rose works as an Account Technician III for DWR's Northeastern Region office. Her passion is conservation outreach and the future of our youth. Rose is the co-founder of Uintah Basin Youth Outdoors, a group focused on mentoring youth who might not have the opportunity to enjoy the great outdoors. RAISING CHILDREN in the rural Uintah Basin, I continually looked for ways to keep them entertained, as well as teach them skills and values they could carry throughout life. Mountains that take your breath away surround “The Basin” (as it’s referred to by locals). We have a plethora of lakes and streams full of fresh fish for the taking. There are campgrounds, ATV trails and hiking trails leading to petroglyphs and dinosaur tracks less than ten minutes from our town. Not to mention Kings Peak, the highest mountain peak in Utah, along with pristine wilderness areas to hunt. In this wonderful setting I set out to instill a love of nature in my children. I wanted them to know how to appreciate all nature has to offer, but also to learn a few things about survival along the way. In our neighborhood, there are sports teams, church organizations and community events, but most of these opportunities are seasonal and operate on certain days of the week. Over the years, arcades and youth facilities have been forced to close their doors for one reason or another. The one recreational opportunity that’s never closed, though, is the great outdoors. There’s no lock and no closing time on nature! Watching the amazement as a child reels in their first fish is a rewarding experience. Next cast… score! You know what I mean if you’ve ever seen someone holding a fishing pole get a bite that bends the pole. 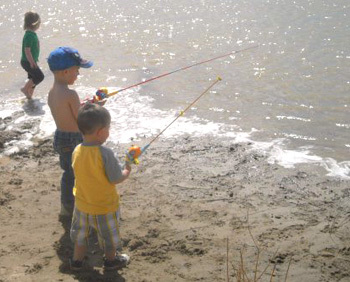 I still remember their lower lip bites and looks of concentration and wonder as they worked to reel in that big fish. The sense of accomplishment beaming from their faces as they admired their catch on a stringer — it’s truly remarkable to witness as a parent. That’s how I hooked them on fishing, and then I was able to reel them in. Watching and helping them learn to fish was a blast, and it’s a gratifying and empowering skill useful to supply food, too! As we teach kids to survive and enjoy the bounty our land can provide, we’re also teaching respect for the outdoors so that generations after us can enjoy it as we do now. By doing so, they’ll understand that we’re the caretakers of nature. These outings set a great example of humanity, awareness and a deep sense of pride in the community. One of the most valuable things we can do for our children is take them outside and teach them to respect wildlife and tread on our lands responsibly. I’ve learned that taking a newbie fishing, hunting or exploring our great outdoors gives the mentor the same feelings of delight and empowerment. Imagine how it feels to know your influence has helped a kid gain knowledge of the outdoors, survival and heritage. Perhaps you already know what I’m talking about! I absolutely love taking kids fishing, the look on their little faces when they have caught a fish is priceless!! Only problem is when the bites aren’t coming thick and fast sometimes it can be quite hard to keep them concentrating on task in hand! In fact, last time I took my nephew fishing and he was catching little perch and I got him unhooking them himself so I though I could leave him be. Next thing, I heard an almighty splash and he has just hurled a huge rock into the water! Talk about scaring the fish off! Needless to say we didnt have any bites after that. Any tips on keeping them interested when the bite is off?